Top-scorer Danny Ings is expected to seal a move to Liverpool at the end of his contract this summer. Ings, who took his tally to 10 goals for the season with the winner at Hull City on Saturday – ending a 10-game drought – has attracted interest from a number of clubs in the Premier League, Bundesliga and the Primera Liga. But Anfield appears to be his chosen destination, with the Reds having tried to secure his services back in January. 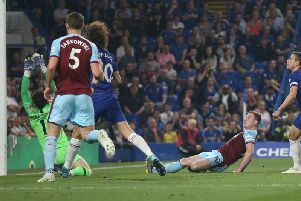 It was thought Liverpool were prepared to pay £4million for Ings and loan him back to Burnley for the rest of the season – but they were told in no uncertain terms that any such move was against Premier League regulations. However, it transpired that, under Rule U8, Liverpool could sign a pre-contract with Ings and his club – subject to the approval of the Premier League Board – which guaranteed the 22-year-old his move to Anfield in the summer and enabled him to stay at Burnley for the remainder of the season. There is no suggestion such a deal was done, but, it seems, providing there are no snags, he is Liverpool-bound. That would be good news for Burnley, who would be in line to earn substantially more for the player in compensation if he stays in England. They could be in line for around £3-£5m – a fee set by the Professional Football Compensation Committee. If Ings moved abroad, compensation would be much lower – €90,000 for every season he spent at the club up to and including the one in which he turned 21. That would equal three seasons, so a payment to Burnley of €270,000, or roughly £206,000.